Get rid of the clutter – do a good job of this, start by removing everything off the desk. Then toss the small bits of paper and shred any unnecessary documents and old paper work or archive them. This is also a good time to get rid of dried up pens and broken office equipment. Be sure to recycle where possible. Clean and sanitise – using a suitable cloth such as a damp microfiber cloth, wipe down all surfaces and drawers, feel free to use a chemical or sanitiser of your choice. If you struggle to get into the corners of the drawers, get the vacuum cleaner and vacuum up those little annoying bits that get stuck in the corner. – Did you know that the average office desk often carries 400 times more bacteria than a toilet seat? Sanitise office equipment – This can often be a scary job for some of us, mainly because we wouldn’t want to damage our expensive computer equipment. Take care when cleaning your screen, keyboard and telephone. Wipe all of these items down using a cloth and some sanitising chemical. For screens only use a solution suitable for computer or laptop screens. 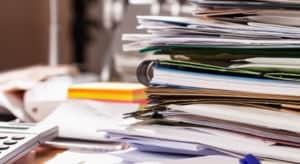 Re-organise your desk – Now that your desk is clean and sanitised you can start organising your desk, keep less important work or work that can be dealt with later further away from your immediate work area so that you can deal with the important items first. So in other words, place everything of importance at an arm’s length around your computer or laptop. 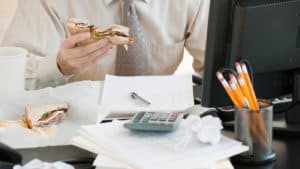 Do not eat at your desk – Not only does this just defeat the purpose of a clean and organised office desk but this is one of the causes of how germs are brought to your work area. Who likes bread crumbs in between the keyboard anyway? Drinking liquids at your desk also comes with its own problems, spills can seriously damage your computer hardware.